Weeks ago, I had a multi course Italian themed dinner party complete with anti-pasti, pasta, carne and dessert. As with most dinner parties, this little get together entailed quite a bit of work and prep, leading me to the conclusion that a dessert made the day or night before was best. What is easier and more convenient when it comes to a plan ahead dessert than panna cotta? It comes together in a manner of minutes then its off to the fridge. When ready, take it out and serve it with fresh berries. As Ina Garten would say, “how easy is that?”. Well, for me, not so easy. As it turns out, whole vanilla pods and fresh berries are not cheap in this part of the world. Sure, you can get all the ingredients to make a vanilla panna cotta drizzled with raspberry sauce and strewn with fresh berries, but it’ll cost you double the amount with no guarantee that the cold storage and transport of these choice morsels would improve their quality. Then it occurred to me: practice what you preach. Instead of shipping in ingredients from abroad, I should be using what is local, abundant and fresh. So, what’s is abundant, local and fresh in this tropical part of the world? Lemongrass, passion fruit and coconut: a heavenly combination. 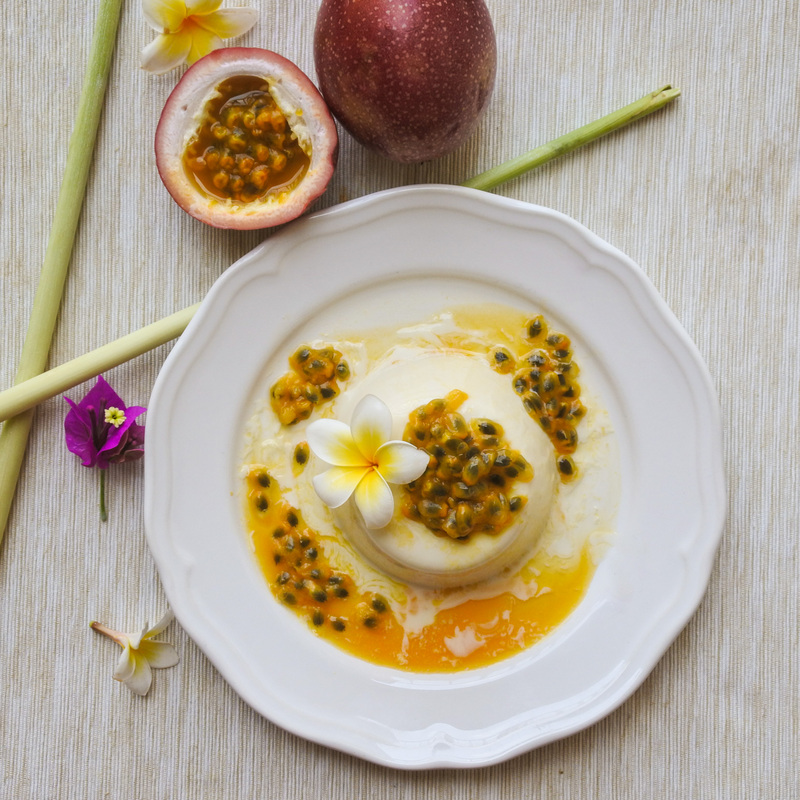 The creaminess of the panna cotta, the tartness of the passion fruit and the crunch of its seeds coupled with the subtle lemongrass finish and sweet coconut milk are just perfect. This elegant desert, with its clever combination of flavors, shows what can be achieved when a little bit of imagination is applied to sustainable and locally sourced options. Combine heavy cream, sugar and lemongrass stalks and stir together. Pour coconut milk into a medium sized bowl and sprinkle with the gelatin. Stir together and let sit for 3-5 minutes. Slowly bring cream mixture to a boil on low-med heat. The cream should take on the flavor of the lemongrass and the mixture should be smooth with the sugar completely dissolved. Gently boil for 2-3 minutes. Add coconut milk with gelatin mixture to the hot cream and mix well. Make sure to rub a pinch of it between your fingers to make sure it is smooth with no bits of grit. Pour into ramekins, small bowls or small glasses (whatever you think is a good size, about 1/2 cup). Cover with plastic cling film and place to cool and set in the fridge overnight. Cut open passionfruit and spoon the fruit over the panna cotta. You can use as little or as much fruit as you like. I prefer 1 passion fruit per every panna cotta serving. Serves 4-5. Eat and enjoy! When ready to eat, dip the bottom half of the ramekin/bowl/glass in hot water to loosen it from the container and transfer to a plate. (You can skip this part if you want and just eat it straight from the ramekin/bowl/or plate as I do) Cut open passionfruit and spoon the fruit over the panna cotta. You can use as little or as much fruit as you like. I prefer 1 passion fruit per every panna cotta serving. Eat and enjoy! Wash and cut the lemongrass stalk lengthwise. Slowly bring cream mixture to a boil on low-med heat. The cream should take on the flavor of the lemongrass and the mixture should be smooth with the sugar completely dissolved. Gently boil for 2-3 minutes. Remove lemongrass stalks. You can pick it out a fork or run it through a sieve Add coconut milk with gelatin mixture to the hot cream and mix well. Make sure to rub a pinch of it between your fingers to make sure it is smooth with no bits of grit. Pour into ramekins, small bowls or small glasses (whatever you think is a good size). Cover with plastic cling film and place to cool and set in the fridge overnight.